My apologies again for a tardy bird of the week, so here is something special. Well, special for me, anyway, as it has been a serious bogey bird for me. All addicted birders and bird photographers have their bogeys, in the sense of ‘an evil or mischievous spirit, a cause of annoyance or harassment’ usually a species that is invisible to the victim or hides whenever the victim is around. 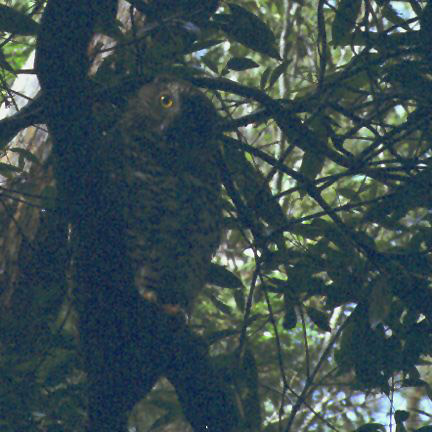 Powerful Owls first cast an evil spell on me on 11 February 1999 when one in Pennant Hills Park made my film camera malfunction so that the entire film was hopelessly underexposed – you can see the wicked gleam in its eye below. As soon as I picked up the film from the chemist the following day, I went back to Pennant Hills Park but the owl was no longer there or no longer visible. Shortly after that I moved from Sydney and switched to digital photography (nowadays we take instant photographic feedback for granted). 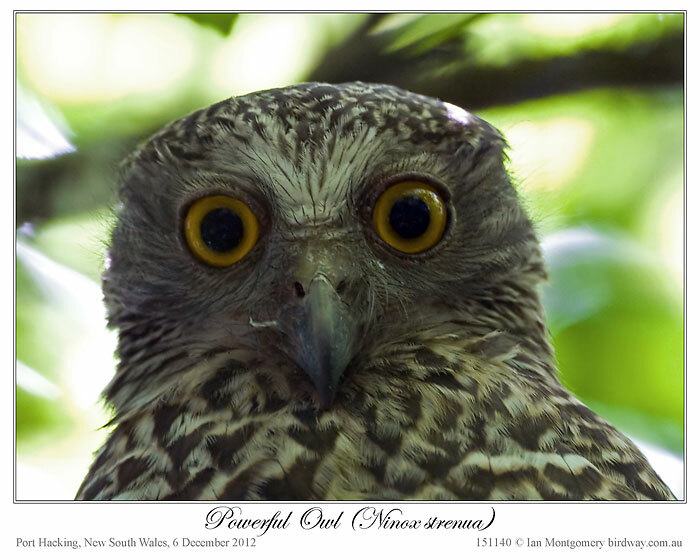 Since then, whenever I’ve visited Sydney I’ve looked for Powerful Owls in all their usual haunts – Pennant Hills Park, Mitchell Park, Beecroft, Warriewood, Royal Botanic Gardens, Royal National Park, etc. – without success. Last Tuesday I gave a talk on parrots to Birding NSW in Sydney and inquired about POs. Yes, one had been seen in its favourite tree, the White Fig, near the entrance to Government House the previous Saturday. I went there on Wednesday and searched the tree for at least 20 minutes but the owl remained invisible until I decided to leave. Delighted with its success, it let its guard down, the spell weakened and I got the briefest visual sensation, like a shimmering mirage, of a barred tail. 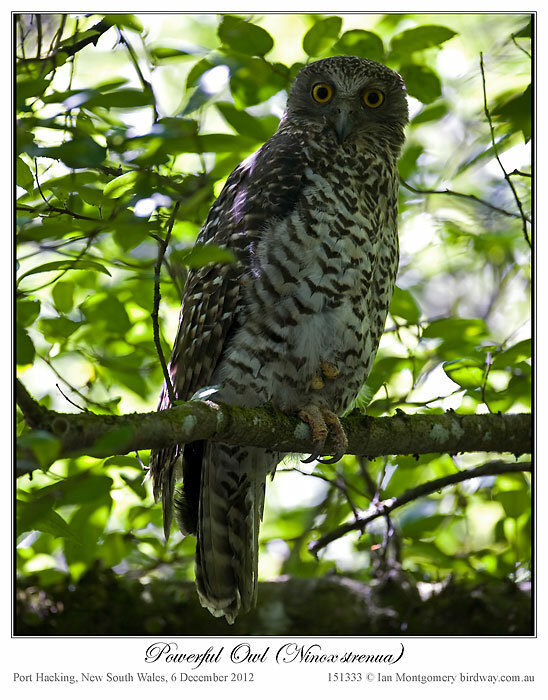 Powerful Owls are big 60-65cm/24-26in in length, it was then quite visible from the ground and not very high up, so a spell is the only explanation. The next day, I went birding with Madeleine Murray and we abandoned plans to look for the owl (they’re quite visible to her) and went instead to Port Hacking, south of Sydney, where, lo and behold, we found another one, or to be more accurate Mad found it after I’d walked straight past it as the spell hadn’t entirely dissipated – it normally does so quite quickly after it has been broken once. 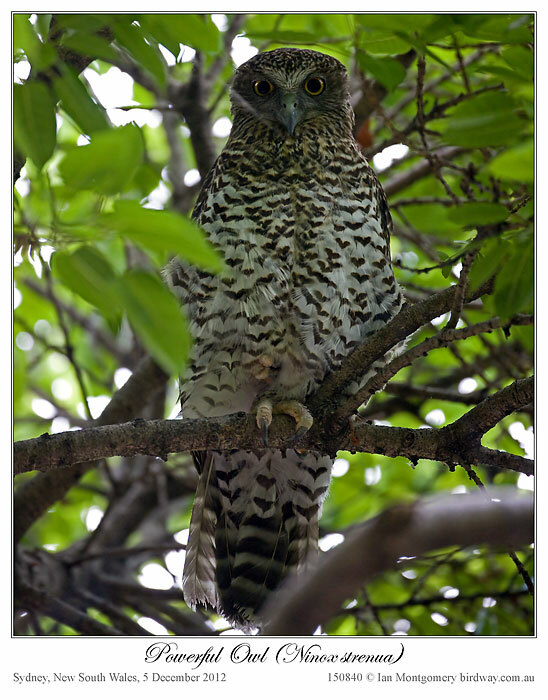 The Powerful Owl is the largest of the Hawk Owls (genus Ninox) and exceeded in size only by the world’s largest owls such as the Grey Grey and the larger Eagle Owls. It is found in eastern and southeastern Australia usually within 200km of the coast from central Queensland to eastern South Australia. It has large territories ranging in size from 3-15 square kilometres so it is nowhere common and is listed as Vulnerable. However, it seems to be quite tolerant of selective logging and can survive in patchy forests. It feeds mainly on arboreal mammals such as possums, but will also take flying foxes (fruit bats) and roosting birds. Glad you sent us a Bird of the Week, Ian. I was starting to worry about you, that maybe you were sick or something. The wait was worth it because this is a beautiful Owl. I am glad you are no longer under this bird’s “evil spell on” you. This entry was posted in Bird of the Week and tagged Australia, Birds, Birdwatching, Ian Montgomery, Nature, Owl, Photography, Strigidae, Sydney. Bookmark the permalink. 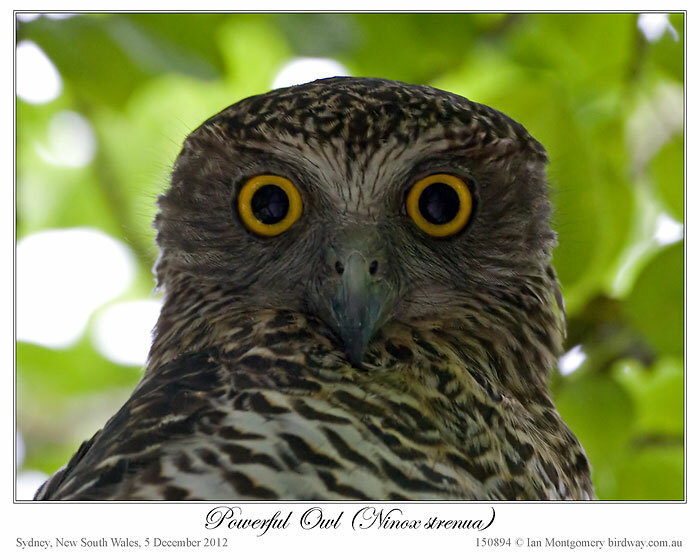 Love the Powerful Owls Lee! We surprisingly spotted a family with two youngsters in Oatley Park Reserve. At first I thought I was looking at a meerkat or mongoose staring at me in the tree, and after locating the adults sitting nearby saw that it was actually a Powerful owl family. Lee, do you live in Australia?